Good morning Britain may have produced one of its first potential convicts. One of the shows main presenters broke the law live on Good Morning Britain earlier today. Watch as Piers Morgan tears new £5 pound note during live Broadcast. Yes piers might be going to jail for doing something during a live broadcast watched by millions of people. 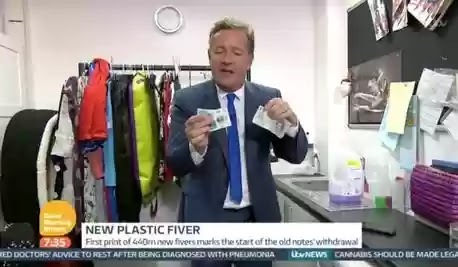 While presenting the show with co-host Susanna Reid, he decided to test out the durability of the Bank of England's new plastic £5 notes. He gave it a wash first. He started out his experiment by putting the money for a spin in a washing machine - but the note was left in perfect condition afterwards. Harmless enough right? He then went berserk with the money. Out of frustration he then attempted to tear the paper cash with his hands before using his teeth, which finally caused it to rip. Then Morgan put himself into deeper trouble. He tore another £5 note with his teeth in celebration, leaving Susanna Reid shocked. "I cannot believe you just did," she said. "I'm not sure if that's even legal. We'll have to look into it." Social media went crazy. Meanwhile, Piers' potentially illegal antics sent Twitter into meltdown as stunned viewers took to the social networking site to express their shock. One fan wrote: "@piersmorgan You're going to jail for destroying money Piers." The new notes cost a ton of money. The new plastic £5 notes cost the Bank of England £70million to develop, while the notes cost around 7p each to print.